Get your geocaching geocoins, geocaches and swag here! Great news! New lower shipping fee! Now get your geocaching items at a Canadian shipping fee! Get your Groundspeak items here in Canada! The next step to geocaching...hide a cache for others to find using cache items found here. You will find cache containers, logbooks, pencils, stickers and even FTF! Need a map that's more tangible? 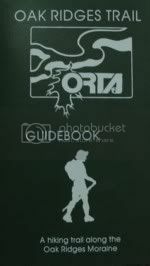 Oak Ridges Trail Guidebook is being sold here or check out the Trails web page for Ontario trails that you can print off! Proclaim your sport by wearing one of these! Pins, bracelets, geocaching toques and more!